It was my maiden expedition from Michigan to New Mexico, visiting my parents, who were “snow-birding” in Alamogordo. 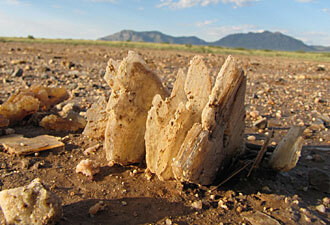 I had never seen the southwestern United States and had always been a fan of eco-tourism. With all of its natural attractions, New Mexico seemed like a wonderful place to spend my seven days of spring vacation. Standing at the cluster of mailboxes at the end of my parents’ street, I could see a thin strip of white nestled at the foot of the San Andres Mountains. “What’s that white stuff in the distance?” I asked my father. 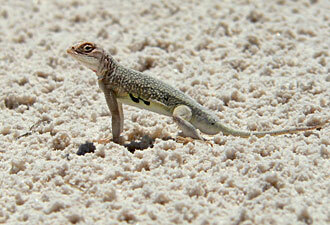 “Oh, that’s White Sands. Would you believe it’s about 25 miles away from here? We should take you there tomorrow…” His rather distracted reply trailed off as he jiggled the mailbox key in its rusted lock. From that moment, I was hooked, mesmerized by this vast stretch of white that seemed to rise out of nowhere and was visible from such a great distance. No matter what it took, if there was only one place I could visit during my time here, it was going to be White Sands National Monument. It was about a 20-minute drive to the monument, and we arrived just as they opened the gates to visitors. I have to admit that I expected a pristine, barren landscape to unfold before me when I entered. Imagine my surprise when I saw the edge of the dune field with its heavy and lush vegetation! It was just after 7 a.m. when we decided to walk the Dune Life Nature Trail. The hike was wonderfully informative, and, though we learned a lot about how the animals survive in the dune field, what really impressed me was the sheer number of plants that grew here. Cottonwood trees, wildflowers, grasses, and a wide variety of shrubs virtually blanketed the landscape. The clouds hung heavy, allowing only patches of sunlight to show through and bathe the white dunes around us in a soft, tranquil light. I was hard-pressed to shake myself from the reverie that came upon me when I saw a lone cottonwood silhouetted against the veiled sky, but I pulled myself away from the scene and finished the hike. As we moved farther into the park, I was again awed by the huge plant pedestals that could be seen from the Dunes Drive, an eight-mile-long scenic road. After speaking with a ranger, we learned that these sculptures in sand are created by plants such as Hoary Rosemary Mint and Skunkbush Sumac that are trying to survive in this ever-changing environment. I asked the ranger just how it was that so many plants are able to live here and was told that it is thanks in part to the very high water table that exists within the dune field. When the sun began to win its battle with the clouds and the temperature rose, we decided it might be time to head on out. Before leaving, though, we popped into the visitor center to watch the orientation video, from which we learned about the unique geology that makes the 275-square-mile dune field possible. Then, our morning spent, I reluctantly followed my parents to their vehicle. I would have to miss the Sunset Stroll taking place that evening, but there was one thing I knew for sure – I would definitely be back for another visit before heading home to Michigan. And return I did. 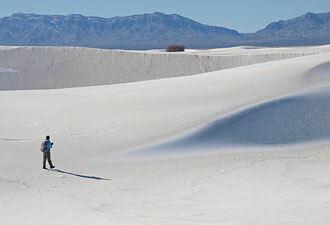 Shortly after my visit, I moved to New Mexico and began working here at White Sands as a ranger. It’s been a fun and exciting place to work, and if I ever get homesick for Michigan, all I have to do is take a drive into the heart of the monument and watch visitors sledding down the dunes. The sand looks just like snow! And of course, there’s so much to do here, like primitive backcountry camping, Patio Talks, biking, and our once-a-month trips to Lake Lucero, that it’s very difficult to get bored. Right now, I’m getting things ready for the next summer full-moon-night event. It should be a blast!